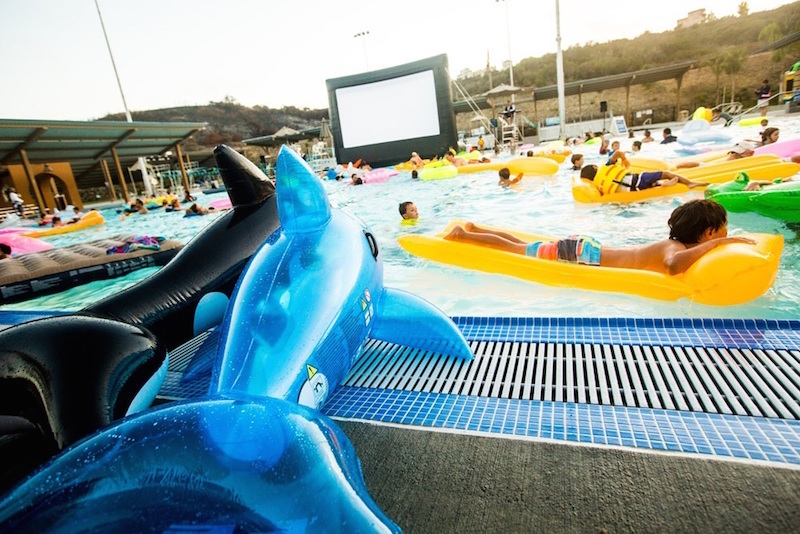 Enjoy pirate themed pool activities and games during the City of Carlsbad’s first Pirate Plunge event at Alga Norte Aquatic Center on Saturday, April 18, from 5 to 9 p.m. Cost is $8 per person. Children ages 3 and under are free. Food and beverages will be available for purchase. Alga Norte Park is located at 6565 Alicante Road in Carlsbad, California. Carlsbad High School Lancer Dancers: (Back Row, left to right) Nicole Mendrala, Tiffany Smith, Sherrie Yasukochi, Piper Cervantes, Sophie DiPietro, Gigi Behun, Haley Crump, Lindsay Foster; (front row: Deviane Von Kaenel, Taylor Ginn, Ellie Meck, Rachel Whitehead. Carlsbad High School’s varsity Lancer Dancers just took second place at the 2015 United Spirit Association’s (USA) national dance competition in the jazz category. 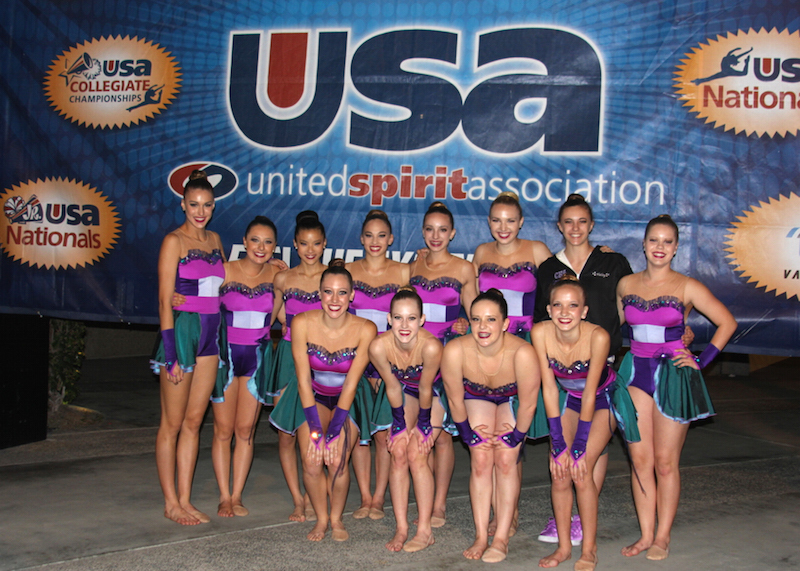 “To make another run at a National Title required some extra effort this year,” said Carlsbad Dance Boosters president, Michelle Ginn. “A back-injury sidelined one of our dancers just days before the competition, and the coach and girls had to make some late adjustments to the routine’s intricate choreography. So we’re extremely proud of the team for their well earned runner-up finish,” Ginn added. We roll through Carlsbad’s northernmost roundabout often. Rarely have we made it through without someone completely botching the flow of traffic with their lack of roundabout understanding. Sure, it’s a European invention that requires a bit of bravery, commitment, and skill, but that shouldn’t stop any of us from mastering the simple skills required. 1. The vehicle in the roundabout has the right-of-way. There. That’s it. That means if you’re rolling up to the roundabout you wait until it is safe to enter. Then once in the roundabout you drive smoothly and safely to the exit of your choice without slowing or stopping. Using your right blinker to let someone know you’re about to exit the roundabout (rather than continuing on) can be helpful at times. But never, ever, stop in the roundabout unless traffic is backedup or you’re avoiding an accident (as we did today) with someone who still doesn’t have a handle on rule number one. Ever wondered what’s behind those massive berms on the North side of Palomar Airport Road just northeast of the Carlsbad Costco parking lot? Well, it’s a theme park called Legoland and thanks to exorbitantly expensive tickets few of us have ever seen what’s behind those berms up close and personal. But do not fear! Our time in the dark is nearly over. The Carlsbad Education Foundation has a solution. Together with Legoland they are presenting the annual Celebrate Carlsbad Day on April 25, 2015. On that day (beginning at 1 PM and not when the park opens) park guests (who purchase tickets ahead of time) will be able to explore Legoland for the much more realistic price of $25 per person. 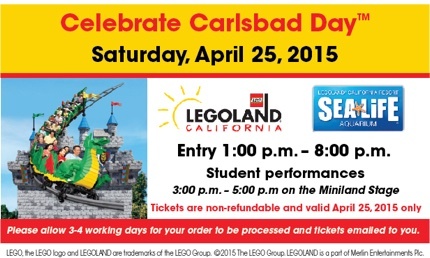 LEGOLAND will donate a portion of the event proceeds to the Carlsbad Educational Foundation (CEF) to support district-wide science initiatives for students at all Carlsbad Unified School District (CUSD) Schools. LEGOLAND will also donate hundreds of free field trip admission tickets to Carlsbad students for hands-on science field trips. 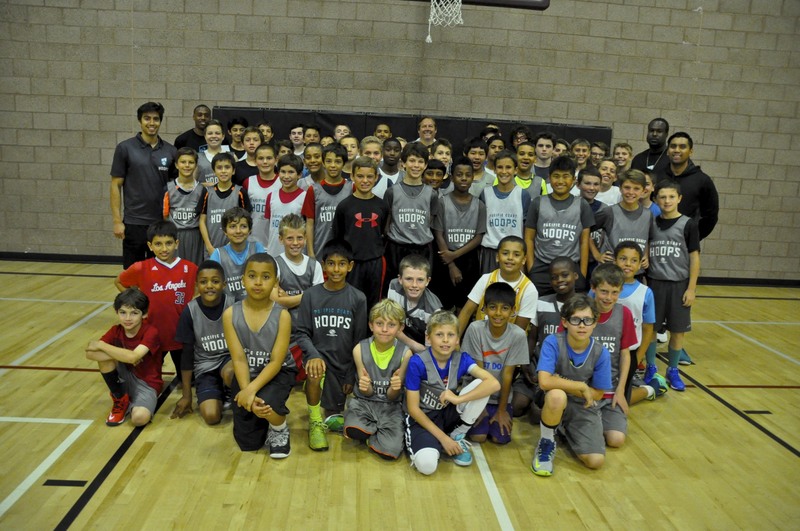 Pacific Coast Hoops players receive pointers from former NBA coach Randy Pfund. Pacific Coast Hoops youth basketball program had the pleasure of welcoming Randy Pfund to the gymnasium at the Boys & Girls Clubs of Carlsbad’s Bressi Ranch Clubhouse on March 11. Randy Pfund is a former NBA head coach and executive. He joined the league in 1985 as an assistant coach for the Los Angeles Lakers under Pat Riley and Mike Dunleavy, and was the team’s head coach during the 1992–93 and 1993–94 seasons. More recently, Mr. Pfund was the General Manager for the Miami Heat and was responsible for bringing Dwayne Wade to the franchise in 2003. . . .Coach Pfund spent two hours with the PCH players and coaches, sharing his wealth of experience having worked with some of the best players in the history of basketball …. Magic Johnson, Kareem Abdul‐Jabbar, Shaquille O’Neal, James Worthy, Dwayne Wade, etc. Join the City of Carlsbad in celebrating the arrival of Spring with the EGGStravaganza Spring Festival Saturday, April 4, from 10 a.m. to 1 p.m. at Poinsettia Community Park, 6600 Hidden Valley Road. 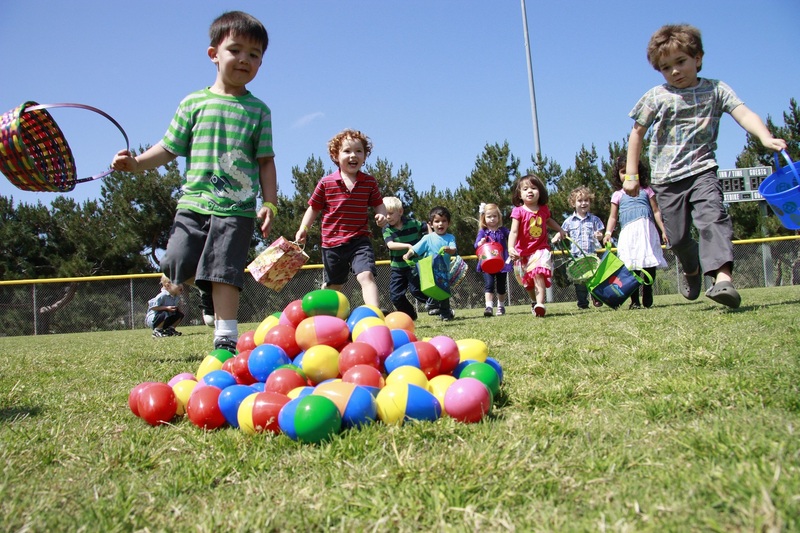 The event features an ongoing “egg scramble” of multiple egg hunts. Groups of approximately 20 to 30 kids will run out to collect all the eggs on the field. That group will exit and the field will be reset for the next group. Parents are welcome to join their kids. To keep the scramble fun for all ages, one field will be arranged for children ages 6 and over who want to race for their eggs, and an identical one will be arranged for children ages 5 and under. There is also a noncompetitive field for young children, children with special needs, and for families wanting to pose for a photo opportunity. Walk + Bike Carlsbad will be hosting a Sand and Strand Walk on March 14 at 10 a.m. Walker should meet up at Choice Superfood Bar & Juicery at the Northwest corner of Carlsbad Village Drive and State St. 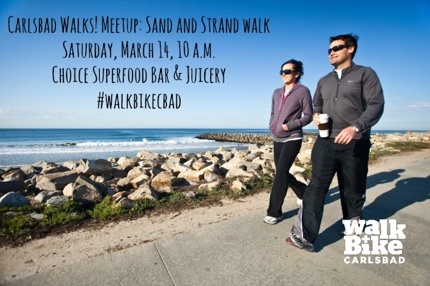 The Walk + Bike Carlsbad team is taking part in “All Is (S)well” month in Carlsbad Village, which is all about prioritizing fitness and nutrition with fun and fulfilling activities for all age groups to enjoy. This is right in line with the Walk + Bike Carlsbad campaign goals and objectives. 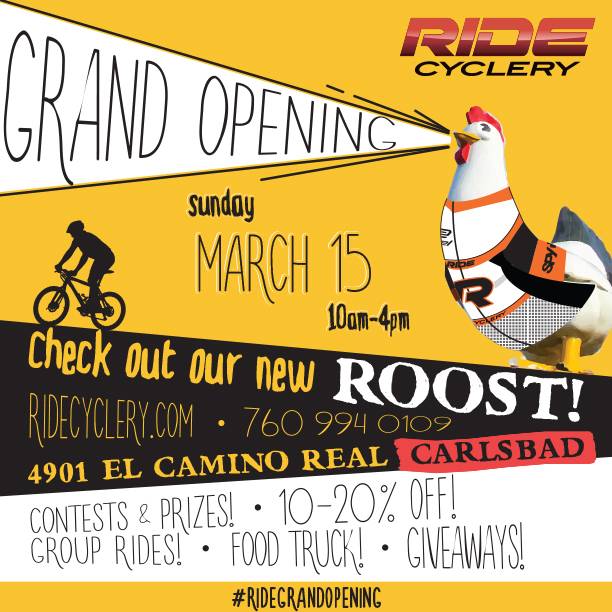 On Sunday, March 15, 2015, Ride Cyclery, Carlsbad’s newest full-service bike shop, is hosting their grand opening event. Join us at our Carlsbad location for a full-day of celebrating this Sunday, March 15! It’s our way to say thank you for all your support so far, and get things rolling in our next chapter, the new Carlsbad RIDE Cyclery. There will be pries, contests, group rides, a food truck, give-a-ways and 10 – 20% off deal in the shop. The party begins at 10 AM and runs through 4 PM. If you’re in the mood, roll by at 8 AM for a Ride/Swami’s group ride that will roll you out through the beauty of North County. 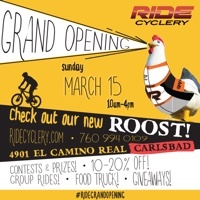 Ride Cyclery Carlsbad is located at 4901 El Camino Real, in Carlsbad. Right under the big chicken. Tomorrow (March 7, 2015) kicks off Carlsbad Village’s month long wellness series called All Is (S)Well. 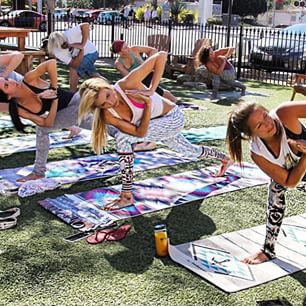 Feel your best every Saturday this March in Carlsbad Village. With its close proximity to the beach and an atmosphere that encourages an active lifestyle, Carlsbad Village introduces All Is (S)well month. A series of weekly classes, All Is (S)well month is all about prioritizing fitness and nutrition with fun and fulfilling activities for all age groups to enjoy. Starting the first Saturday in March, locals and visitors to the Village will start their weekend on a high note by participating in yoga, pilates, and walking throughout the month. Choice Juicery is the ideal setting, with their nutritious offerings that can be enjoyed pre or post-workout on their spacious lawn. Treat the body and mind with kindness by being an active participant of All Is (S)well month. Dr. Gina Loudon, the co-author of What Women Really Want will be speaking at a luncheon hosted by the Carlsbad Republican Women Federated on Tuesday, March 24, 2015. Dr. Gina has two master’s degrees and a PhD, and is a homeschooling mother of 5, one by the blessing of adoption who has Down Syndrome. She is credited as one of the 100 founding members on the Tea Party Movement. Dr. Gina moved to Southern California in 2012 to engage in the culture war and made a big splash when she appeared on a prime time ABC reality show as an outspoken conservative.